Trunks: 1-2 feet diameter, bark gray-brown, shallowly fissured, long, flat, often loose plates; inner bark mucilaginous. Crown broad, open; branches spreading. 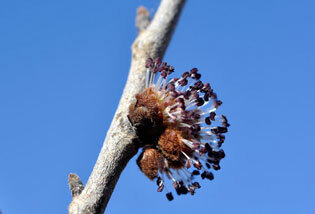 Twigs: Gray or brown, pubescent; leaf scars half-round, bundle scars in three groups; leaf buds reddish-brown, narrowly ovoid, obtuse, slightly hairy; flower buds broadly ovoid, 1/6 to 1/5 inch, densely pubescent with reddish-brown hairs. Leaves: Alternate, simple, deciduous; petiole 1/6 to 2/5 inch, pubescent; blade oval to ovate or obovate, 4 to 6.4 inches long, 2 to 3 inches wide base strongly asymmetric, oblique, rounded on one side, margins coarsely double serrate in distal 1/2 to 3/4, singly serrate proximally, tip acute to acuminate, upper surface dark yellowish-green, harshly scabrous, lower surface paler, pubescent. Flowers: Before the leaves; borne in crowded clusters of 8 to 20 flowers; pedicels less than 1/12 inch; calyx bell-shaped, 1/10 to 1/6 inch, pubescent with reddish-brown hairs; calyx lobes 5-9, green to reddish, tips rounded; corolla absent; stamens 5-8; filaments whitish, 4-5 mm; anthers dark red; ovary green, egg-shaped, flattened, pubescent; stigmas 2, reddish, pubescent, exserted. Fruit: Late April or early May; dense clusters of 3-10 samaras; pedicels 1/12 to 1/6 inch; samaras nearly circular to obovate, 1/2 to 3/4 inch, one seeded with broad wing, slightly notched at apex with the wing points rounded and overlapping, margins glabrous; seed body ovoid, flattened, reddish-brown tomentose. Habitat: Stream banks, pond margins, bottom lands, roadsides, disturbed areas; often in rich, moist soil, occasionally on rocky slopes. Uses: Native Americans used a poultice of inner bark to treat wounds and burns, took a decoction of inner bark as a laxative, and chewed the inner bark for sore throats. Several plains tribes also used the inner bark fibers to make cords. Comments: Rubra alludes to the reddish woolly buds and the color of the wood. Slippery elm alludes to the mucilaginous inner bark. The wood is strong and durable, dark reddish-brown with a narrow, lighter colored sapwood. It has been used for fence posts, window sills, and railroad ties.